In the 1980s, scientists developed synthetic cannabinoids as a means to study the endocannabinoid system. [1,2] While some earnest chemists characterized cannabinoid receptors, more entrepreneurial chemists created a novel market of NEW drugs—nontraditional emerging web-based drugs. 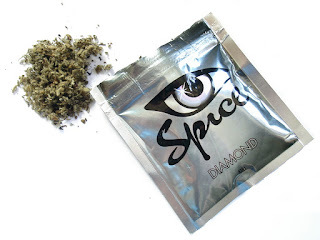 Synthetic cannabinoids (SCs) are one varietal of these NEW drugs, and their use has been growing exponentially since they were first recognized as drugs of abuse in Europe in 2000. When SCs came to the USA in 2008, they flourished because of a lack of legislation against them and because they evaded standard medical toxicology screening tests. Sold over the internet, in head shops, and in even in gas stations and convenient stores, SCs are often marketed as “legal highs.” They can be consumed in a number of ways, from adding the compound to plant materials to dissolving the compounds in liquid for use in e-cigarettes or beverages. With the majority of SC commerce occurring over the Internet, it is difficult to say with certainty which populations are buying and using SCs. However, these NEW drugs are thought to be popular with young people experimenting with drugs and with adults seeking to evade drug detection like military personnel or those seeking a new employment opportunity. In a study examining substance abusers undergoing treatment, SC users described the following motivations: curiosity/experimentation (91%), feel good/get high (89%), relax (71%), and get high without the risk of a positive drug test (71%). This study population predominately smoked SCs (91%), while 27% used alternative methods of consumption. SCs encompass a variety of chemical compounds with varying “brand names,” listed below. Many of these compounds differ in their binding affinities to cannabinoid receptors, in their metabolites, and in their pharmacokinetics — and therefore vary in their duration and effects. Effects of using SCs range wildly, from “desired effects” similar to those of marijuana to adverse effects such as those listed below. Believed to have a stronger binding affinity for cannabinoid receptors than marijuana’s tetrahydrocannabinol (THC), SCs have a higher prevalence of adverse effects. In addition, SCs are most often applied to herbs to be smoked, and the effects of those herbs are not well characterized, adding yet another element of danger to the consumer. Because of the growing popularity of SCs and concerns about their negative effects, by 2011 the DEA had placed fifteen SCs in Schedule I of the Controlled Substances Act . By 2012, ten additional SCs were added to that list. As laws catch up to make known compounds illegal, new compounds sprout up in their stead. And these newer NEW drugs may be more dangerous than their predecessors. Unlike the well-characterized, well-studied earlier SC compounds whose pharmacokinetics we do understand, these drugs that are rapidly developed to elude our legal regulations and have unknown binding affinities, selectivities, half lives, and metabolites. Despite lawmakers best efforts to keep up with the prolific SC-developing scientists, NEW drug use and SC use is growing at alarming rate. From mid-March to May 2015, Mississippi saw 1200 ED visits related to SC use while Alabama saw > 1000 visits. In Mississippi, those 1200 visits included 17 deaths while Alabama’s visits included 5 deaths. As the number of patients using SCs continues to grow, so must our awareness of this emerging class of drugs. Treatment of SC-related symptoms is supportive and includes benzodiazepines, cooling measures, and respiratory and hemodynamic support as needed. Potential or confirmed SC use should be reported to local poison centers or public health agencies so that we can better characterize these NEW drugs. While our standard ED drug screens do not detect SCs, commercially available SC detection systems are available, although they do not detect for the presence of all SCs. Moreover, while there is no current antidote for SC intoxication, studies suggest that a selective antagonists against the CB1 cannabinoid receptor called SR141716 and the opioid antagonist naltrexone have potential as SC reversal agents. Such developments provide hope that we might someday turn these NEW drugs into an old problem. 1. Trecki J, Gerona RR, Schwartz MD. Synthetic Cannabinoid-Related Illnesses and Deaths. N Engl J Med. 2015;373(2):103-7. 2. Baumann MH, Solis E, Watterson LR, Marusich JA, Fantegrossi WE, Wiley JL. Baths salts, spice, and related designer drugs: the science behind the headlines. J Neurosci. 2014;34(46):15150-8. 3. Mycyk MB. Emerging drugs of abuse: what was new yesterday is new today. J Med Toxicol. 2012;8(1):1-2. 4. Rosenbaum CD, Carreiro SP, Babu KM. Here today, gone tomorrow…and back again? A review of herbal marijuana alternatives (K2, Spice), synthetic cathinones (bath salts), kratom, Salvia divinorum, methoxetamine, and piperazines. J Med Toxicol. 2012;8(1):15-32. 5. Besli GE, Ikiz MA, Yildirim S, Saltik S. Synthetic Cannabinoid Abuse in Adolescents: A Case Series. J Emerg Med. 2015;49(5):644-50. 6. Namera A, Kawamura M, Nakamoto A, Saito T, Nagao M. Comprehensive review of the detection methods for synthetic cannabinoids and cathinones. Forensic Toxicol. 2015;33(2):175-194.